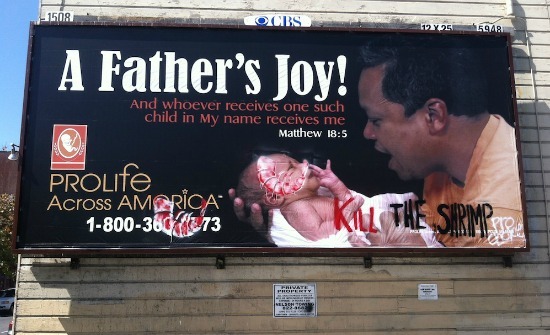 After that, Pro-Life Across America had the billboard removed, but the vandals weren’t finished. They had one last message to leave. Because, you know, babies are the complete antithesis of anything joyful. They will ruin your life. The president of Pro-Life Across America, Mary Ann Kuharski, told LifeSiteNews that vandalism like this rarely happens. It’s easy to see that a billboard spray-painted with “kill the shrimp” probably isn’t too helpful to the pro-abortion movement, especially since they like to avoid the sticky truth of the whole “murder” part of abortion. Weekly newspaper SF Weekly, published by Village Voice Media, ran several stories on the subject. What did they think of the criminal vandalization? Last week, liberals across San Francisco were thrilled by the work of some left-leaning artists who took it upon themselves to revise a pro-choice billboard spotted along Cortland Avenue. It was like really cheap neighborhood beautification! As first spotted by Bernalwood, some “hackers” saw this political billboard on Cortland Avenue and decided it was in need of a major redesign. … Just think of it as free beautification. So the conservatives behind that pro-life billboard finally took a hint. And that’s how politics in San Francisco works. Not only was this vandalism a criminal act, it was also tasteless and despicable. It is one thing to be pro-abortion; it is quite another to react to seeing a black father happy with his son by actually encouraging black families to kill their children instead. And pro-aborts wonder why pro-lifers see inherent racism in the abortion industry. And the SF Weekly reacted by calling it a “neighborhood beautification.” Disgusting.